Some of the best memories are made in flip flops … while eating this dish. Summer’s back. 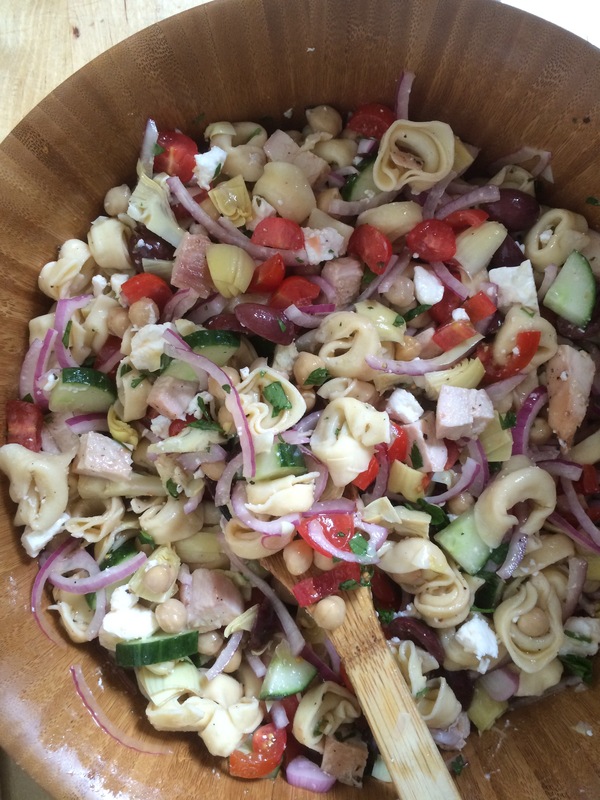 Time to make Greek tortellini pasta salad. 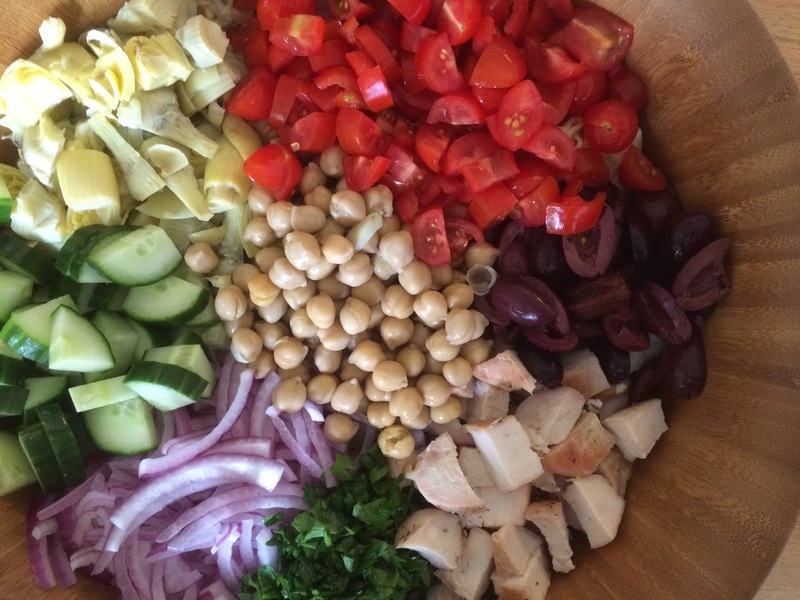 Here’s my update on the classic Greek salad. I mixed it up by adding cheese tortellini, shredded chicken, and a couple other tid bits. I’ve always got cheese tortellini on hand for simple weeknight suppers. Always a crowd (or, just me) pleaser. 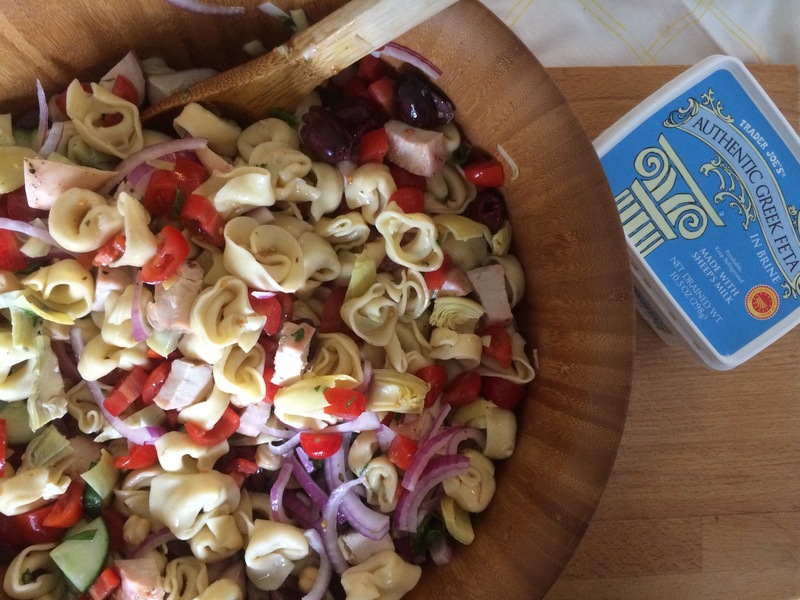 This also works wonderfully for picnics, potlucks, bbqs, or a weeknight meal. Perfect for summer. Bright and easy. Just like my favorite pair of flip flops. Pre-heat oven to 350 degrees F. Season chicken breasts with salt and freshly cracked black pepper. Cook for 35 minutes or until internal temperature reaches 165 degrees F. Set aside until cool enough to handle and cut into bite sized pieces. Alternatively, dice 3 cups of rotisserie chicken. Bring a large pot of salted water to a boil. Cook tortellini in boiling water for 5-7 minutes, or according to package directions. Drain and rinse under cold water until cool. Set aside and reserve. 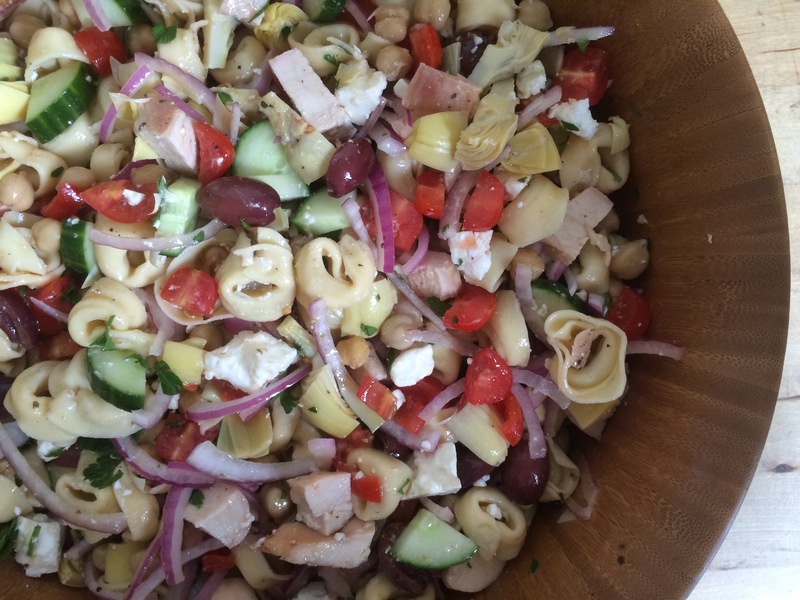 Combine cooled tortellini, shredded chicken, cherry tomatoes, cucumbers, red onion, artichoke hearts, chickpeas and kalamata olives in a large bowl. Make dressing by combining olive oil, red wine vinegar, garlic, salt, freshly cracked black pepper, and dried oregano. Mix well. Toss salad with the dressing. Start by adding half of the dressing and add more to suit your taste. 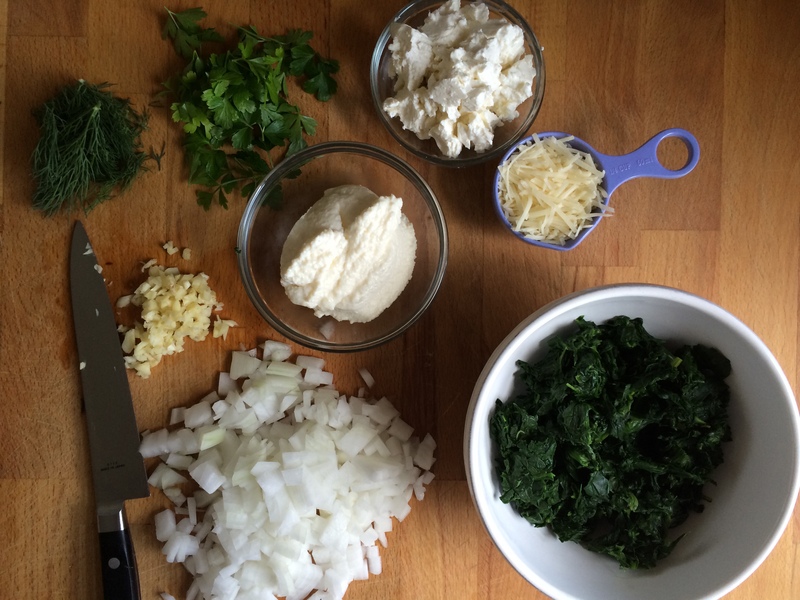 Add feta cheese and fresh parsley. Toss well and serve. Note: Salad can be served right away but is best cooled in the refrigerator for a few hours. Salad will keep well for 3 days in the refrigerator. All excuses for literary creativity aside, these wings are really good and really unique. 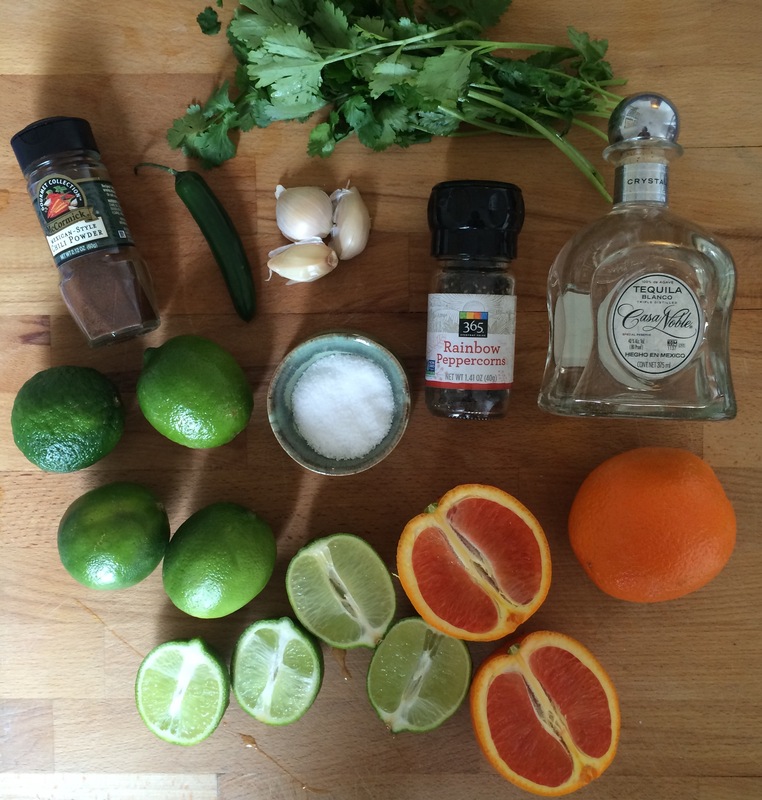 The tequila and lime hit you right off the bat, while the heat from the jalapeno and chili powder slowly sneak in. 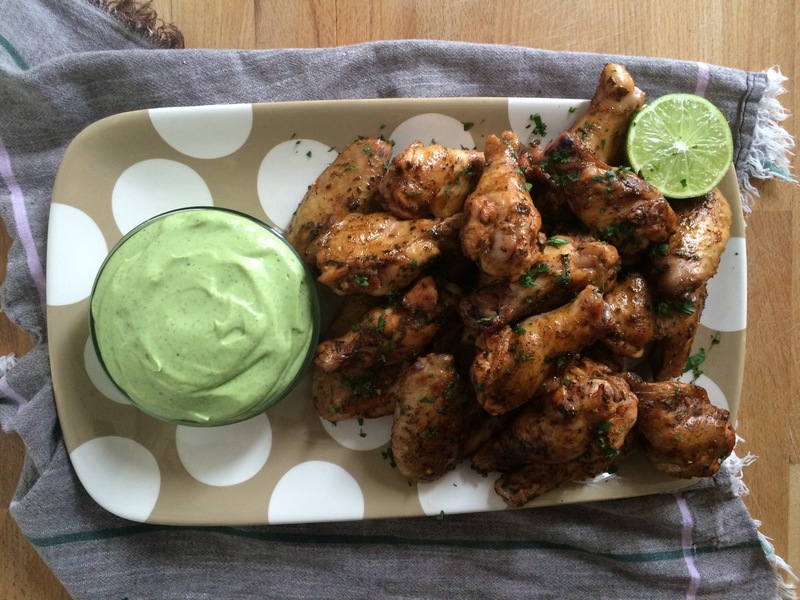 Dip ’em in the vibrant green sauce and you’ve got a meal any Jimmy Buffet fan would be more than happy to devour. If you’re not a Jimmy Buffet fan, then just pretend you didn’t read the above and know that these wings are delicious. First, make the chicken marinade. Combine tequila, lime juice, orange juice, chili powder, jalapeno pepper, garlic cloves, salt, pepper, and cilantro in a blender or food processor. Blend until all ingredients have been chopped, 2 minutes. 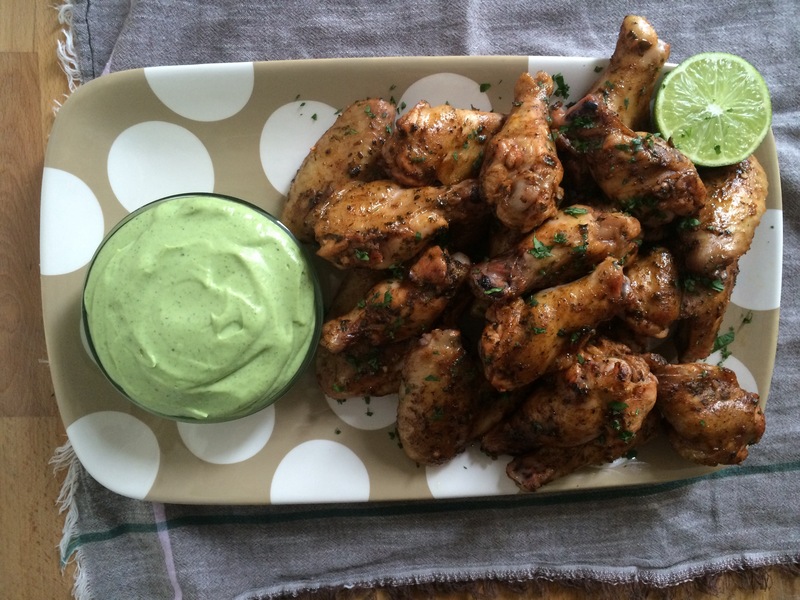 In a large bowl combine the chicken wings and the marinade. Refrigerate for at least 2-3 hours and if possible, overnight. Preheat oven to 400 degrees F. Line a rimmed baking sheet with foil. Place baking rack on top of foil. 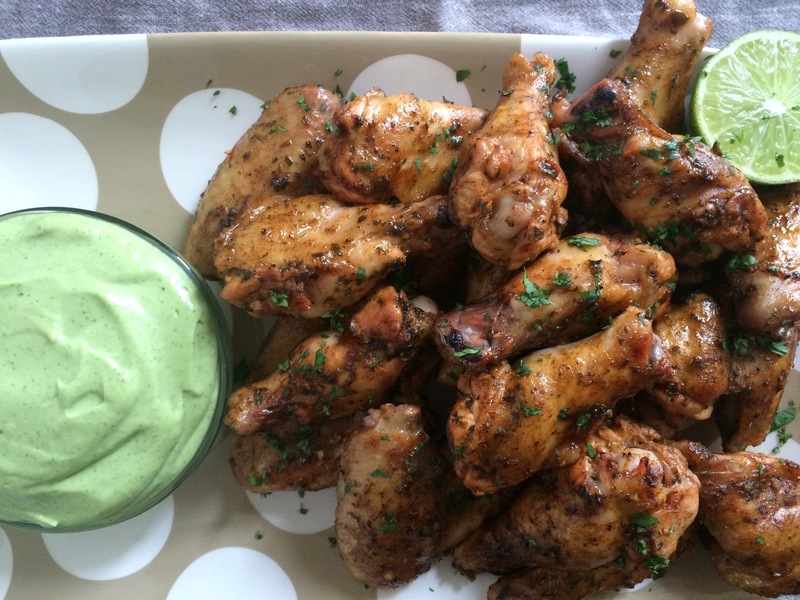 Place wings on rack. Transfer the marinade to a sauce pan. Bring marinade to a vigorous boil over high heat for 2 minutes, then reduce heat to medium-low and cook for 20 minutes until sauce has thickened. Bake chicken for 45-50 minutes, turning chicken and basting with reduced marinade multiple times throughout. Broil or throw on the grill for the last 5 minutes of cooking to crisp up the skin. 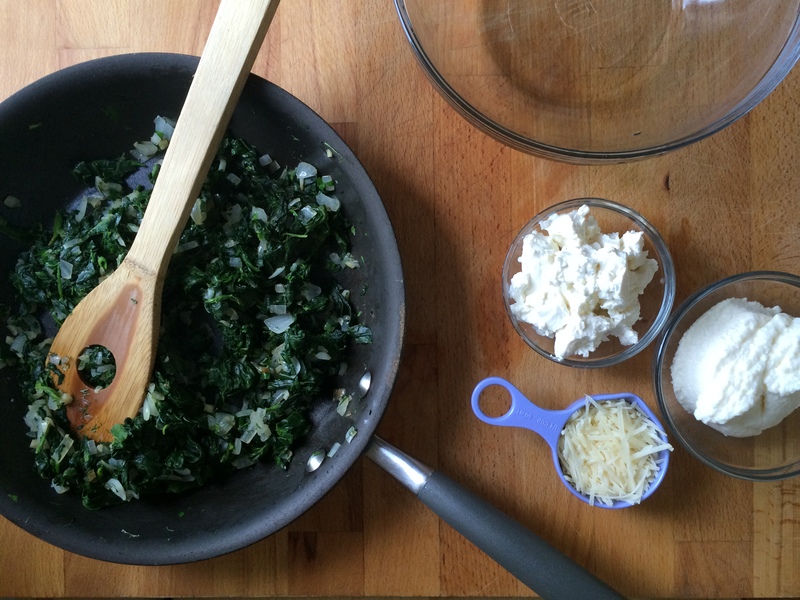 While wings are baking, combine dip ingredients in a food processor and blend until smooth and creamy. If you double the recipe, no need to double the sauce. There will be plenty leftover. 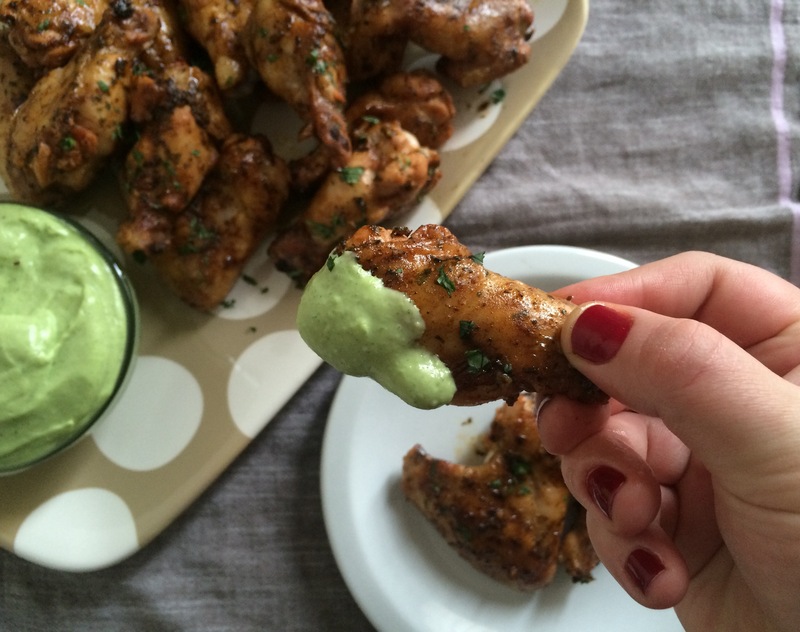 Sprinkle wings with freshly chopped cilantro to serve. Add a side of dipping sauce and plenty of napkins. Note: Cooking alcohol in a pan over medium heat or when in the oven will reduce most of the alcohol through evaporation, but not all. Do be aware, if you are serving children. Thank you Casa Noble for sponsoring this post. Unlike my last post, I can’t claim to have coined the above phrase. 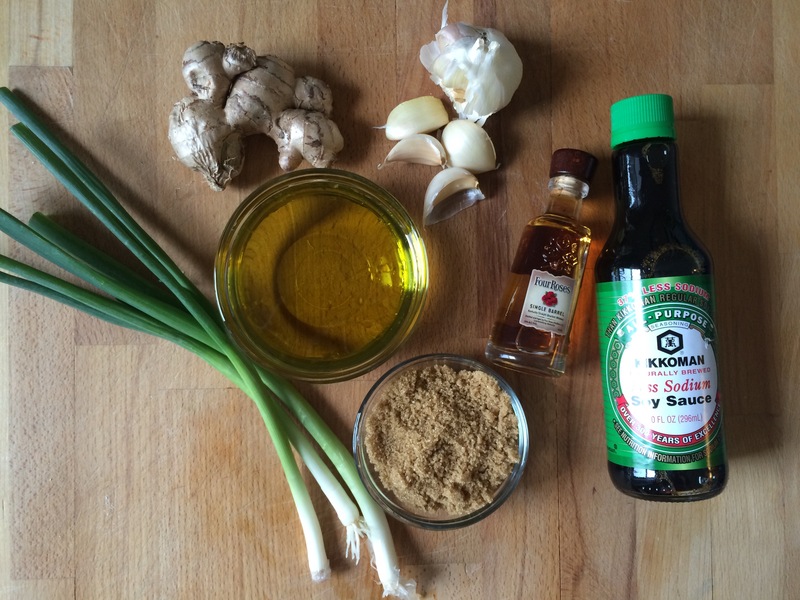 I can claim a wonderful recipe worthy of staying home in your cozies, and far better than your local take out. I can also claim a sauce that you’ll quickly become addicted to. Let’s roll. 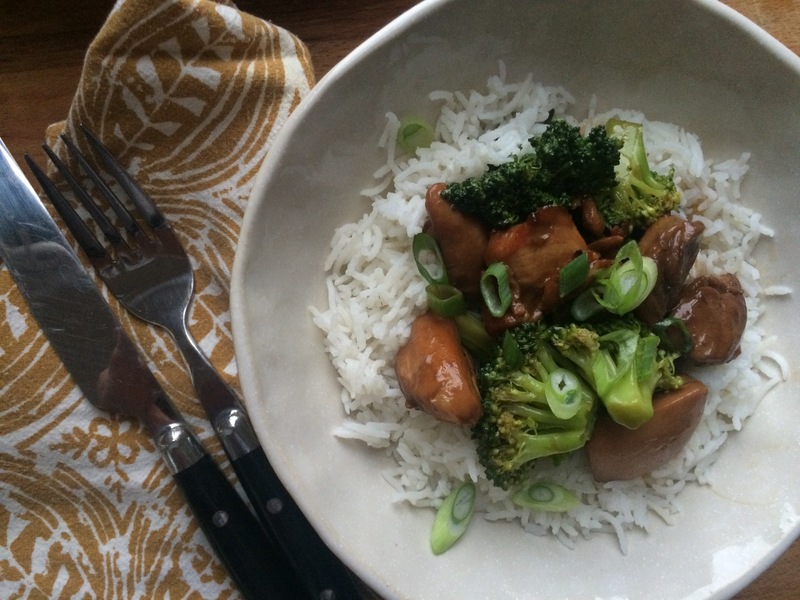 This bourbon chicken and broccoli is served over hot steaming basmati rice and topped with sliced green onions. Putting this dish over the top is the sticky, tangy, syrupy bourbon sauce. I don’t want to use an exhausted cliche TV food host phrase, saying ‘you could put this sauce on my shoe and I would eat it!’ … but I would. This meal does require a little pre planning, the longer you can marinate the chicken the tastier it will be. C’mon. Place an order to your own kitchen to stay in. Always worth it. 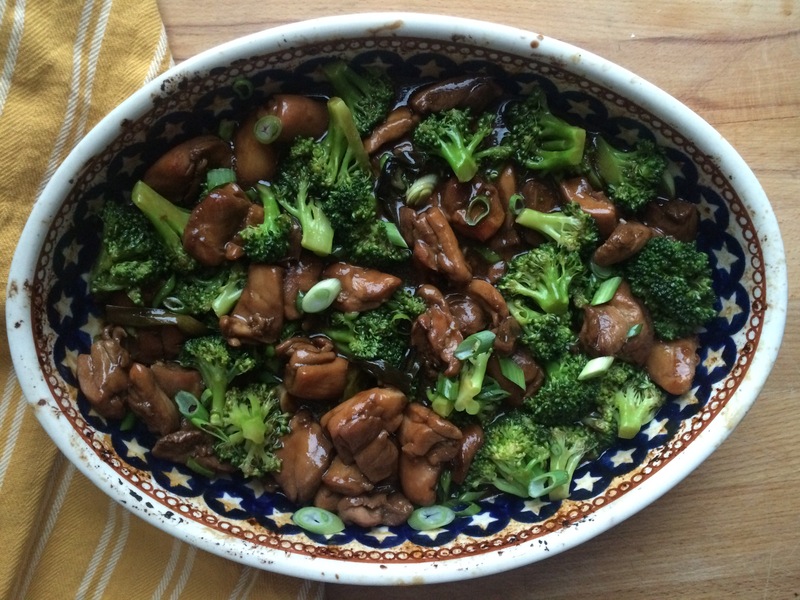 Combine the soy sauce, oil, vinegar, bourbon, and brown sugar in a baking dish (casserole dish with high sides). Whisk until combined. 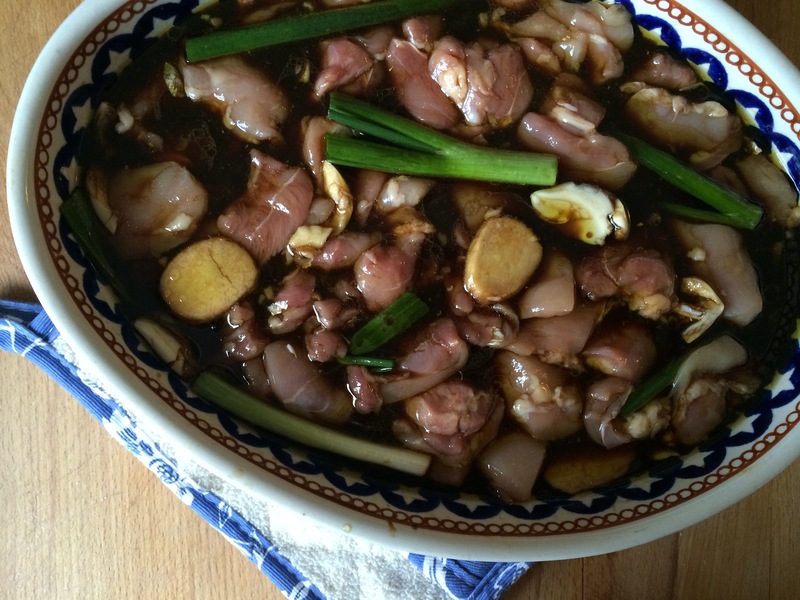 Add chicken, ginger, garlic, and 3 green onions that have been cut into thirds. Cover and marinate for at least 2 hours and up to overnight in the refrigerator. Remove the chicken from refrigerator and let come to room temp when preheating the oven. Preheat oven to 350 degrees F. Uncover the chicken and bake directly in the marinade for 40 minutes, rotating the chicken half way through to ensure pieces are baking in the sauce on both sides. Remove chicken from oven. Discard the ginger and garlic. 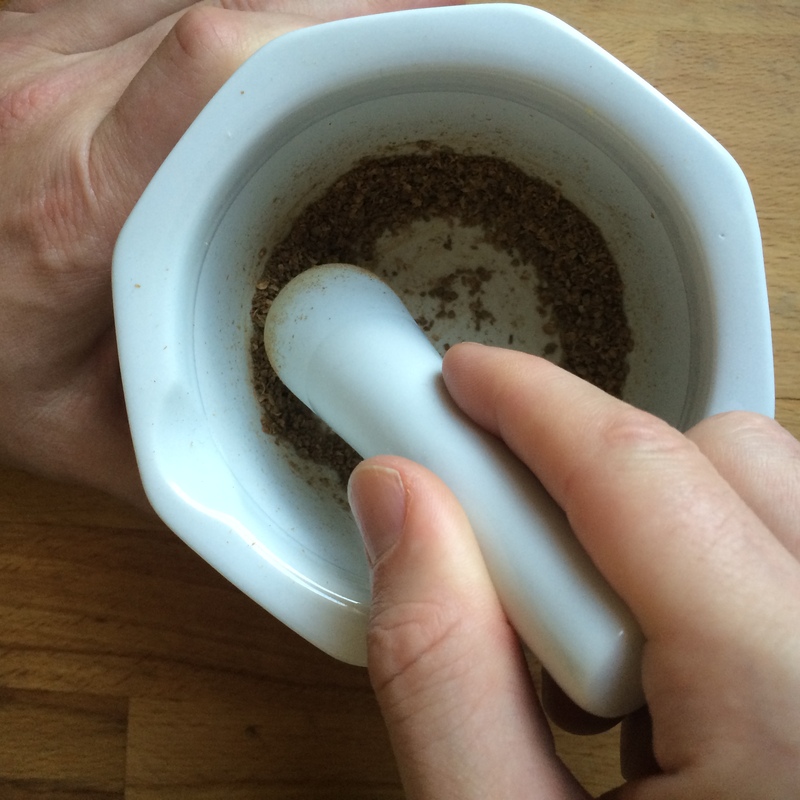 Strain the liquids into a small saucepan. Heat saucepan over medium heat until a slow boil is reached. Slowly add slurry to saucepan and whisk until incorporated. Cook over low heat for 10 minutes, stirring frequently until reduced and thickened. 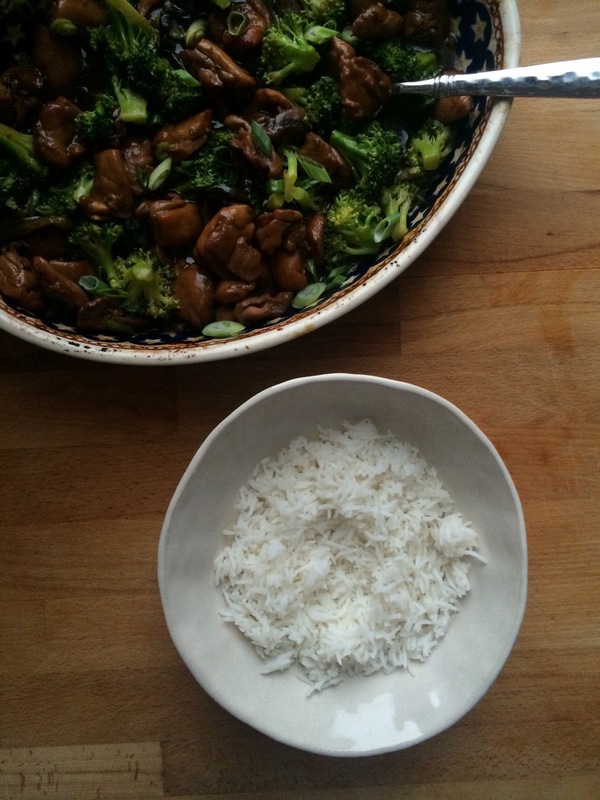 Meanwhile, steam broccoli and cook rice according to package directions. Return chicken to the oven and broil on low for 5-8 minutes to caramelize, rotating pieces half way through. You can do this right in the same casserole dish. Watch closely, as all broilers cook at different heat. Do not burn your chicken! 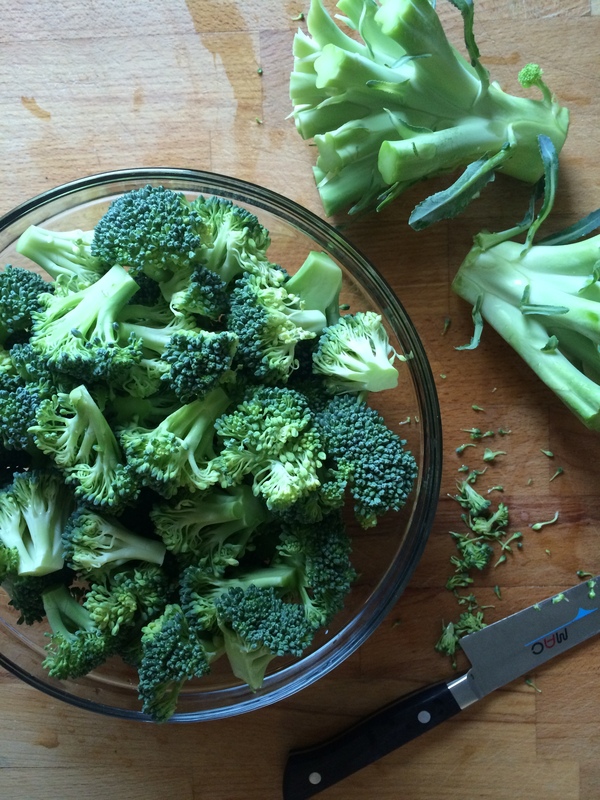 Remove chicken from oven, toss with steamed broccoli and half of the reduced sauce. Add additional sauce to your preference. 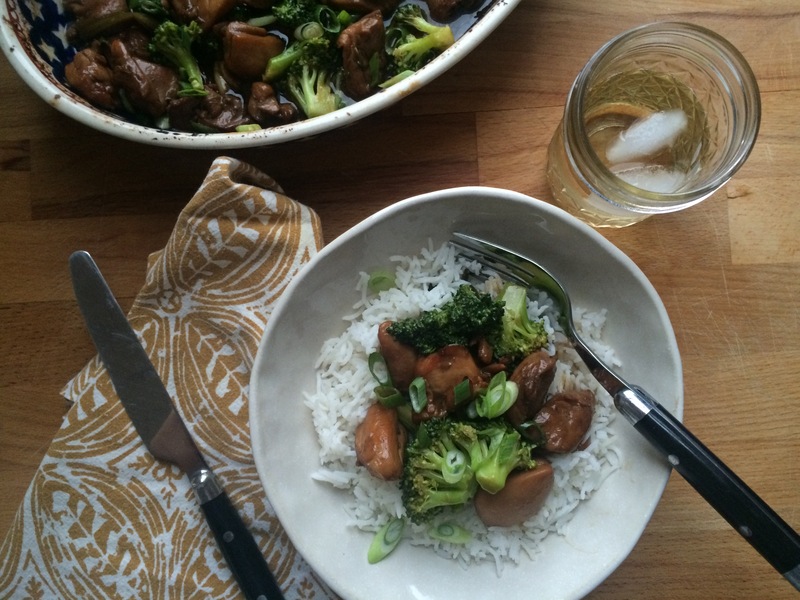 Serve over white rice and top with sliced green onion. Thank you Four Roses Bourbon for sponsoring this post. This dish accomplishes three ever-important objectives. 1) Delicious taste. 2) The kitchen is filled with a wonderfully unique and enticing aroma. 3) Easy to make. Three objectives met. One adjective needed. Indian food is all about the spices. While there are numerous spices to choose from, I brought this particular taste of India home by focusing on these basics. Sweet cinnamon, smoky cumin, spicy cayenne, lemony coriander, and warm garam masala. This is far from an intimidating spice list. In fact, I bet you have most in your spice cabinet. But even if you don’t, all of these spices are easily accessible and affordable. 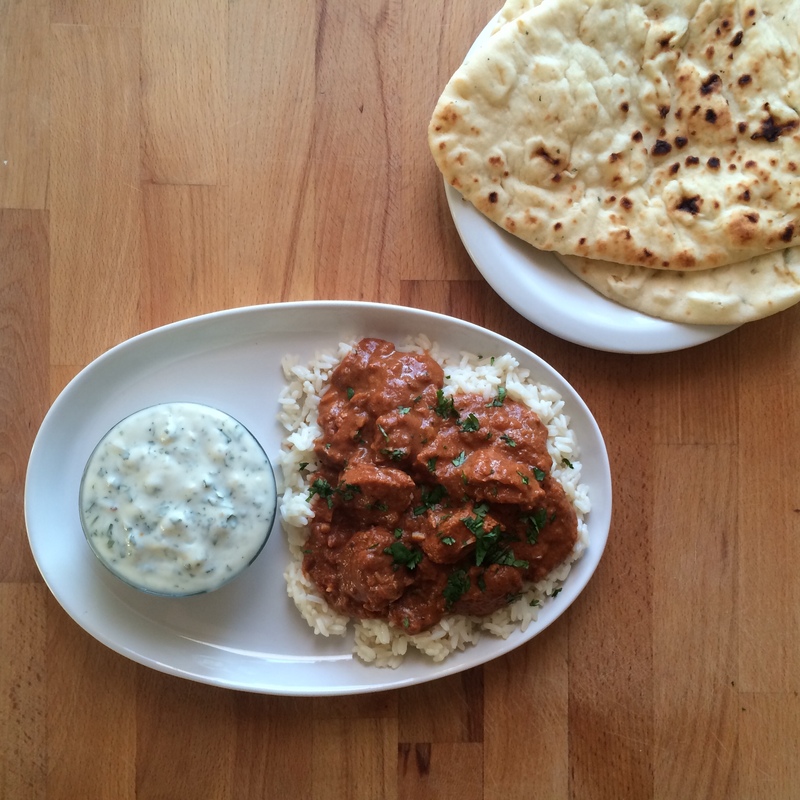 Garam masala was the only new spice I had to purchase to complete this dish. 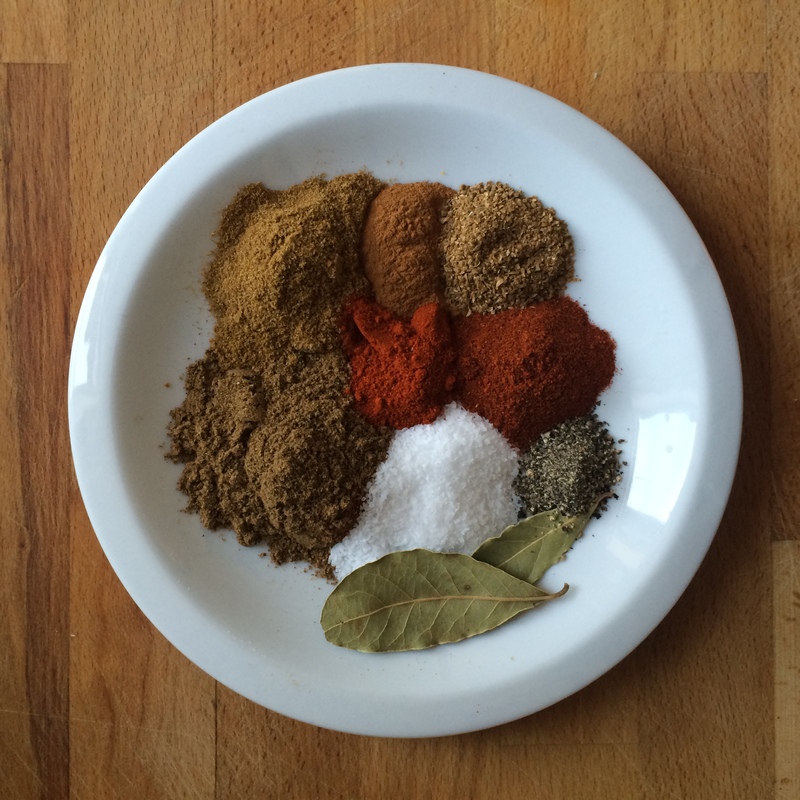 Garam masala is a Northern Indian style spice blend. The composition of garam masala differs according to regional and personal taste. 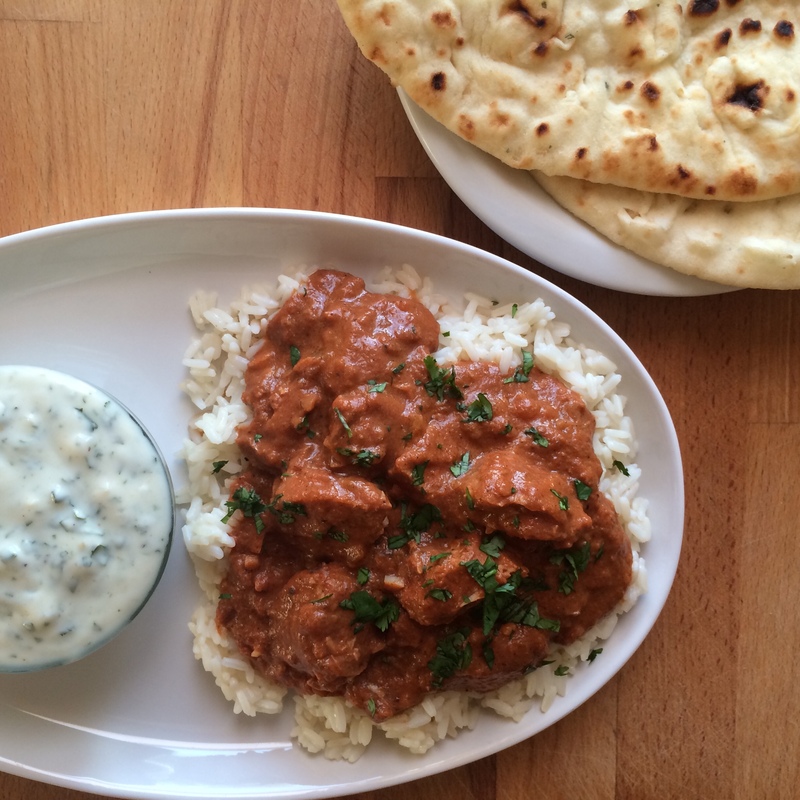 The specific blend I used is a tripart mixture of cardamom, coriander and black pepper. Well worth the investment. I like to serve this dish over fluffy white rice. 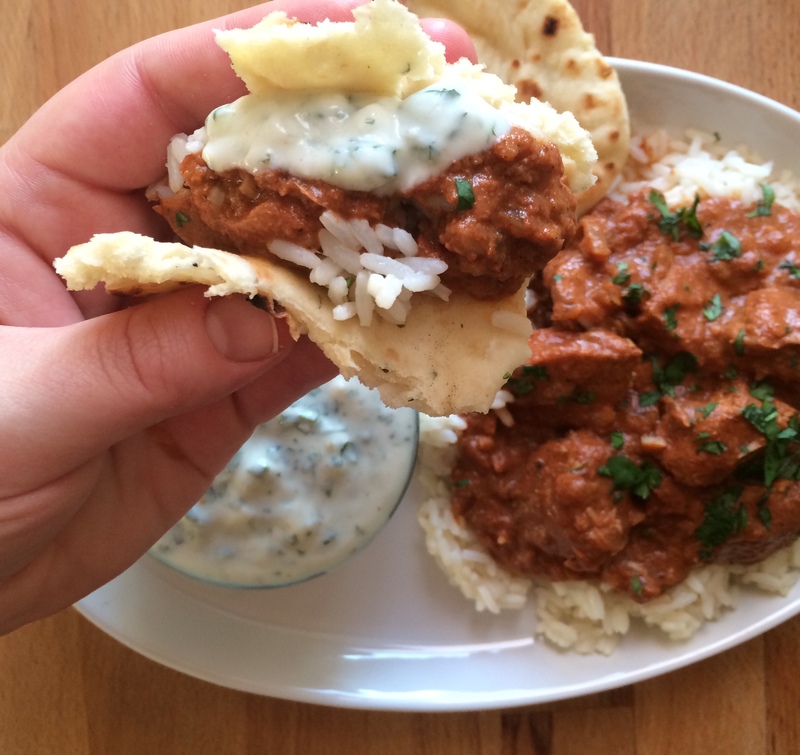 As an accompaniment, a heaping scoop of cilantro yogurt sauce and a plate of warm naan. Don’t skip the sauce, it brings a cooling balance to the dish. Cut chicken breast into 1 inch pieces and reserve. In the bowl of your slow cooker, combine onion, garlic, ginger, strained tomatoes, olive oil, garam masala, cumin, sweet paprika, salt, coriander, cayenne pepper, cinnamon, lemon juice, and black pepper. Stir to combine. Add chicken breast. Stir to combine, and nestle bay leaves into the sauce. Cook on low for 5 1/2 hours. 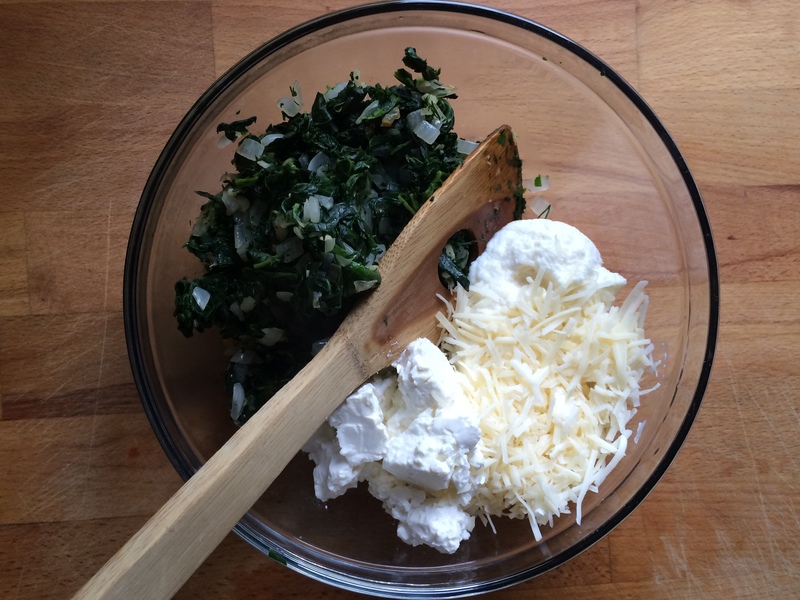 Meanwhile, prepare yogurt sauce by combining all of the ingredients into a small bowl. 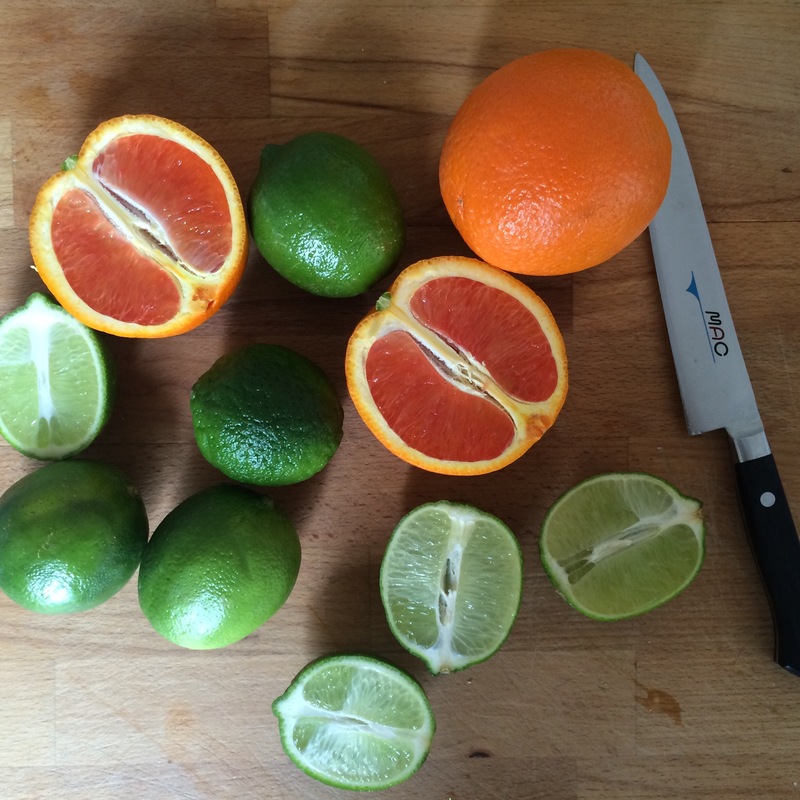 You can do this several hours before serving to allow flavors to meld together. Refrigerate until ready to use. Whisk together half and half and cornstarch in a small bowl, and add to the slow cooker. Stir well and cook with the lid off for an additional 30 minutes. Remove bay leaves and discard. Total cook time is 6 hours. Note: If you haven’t already done so, prepare rice. Most long grain rice takes approximately 30 minutes to cook. 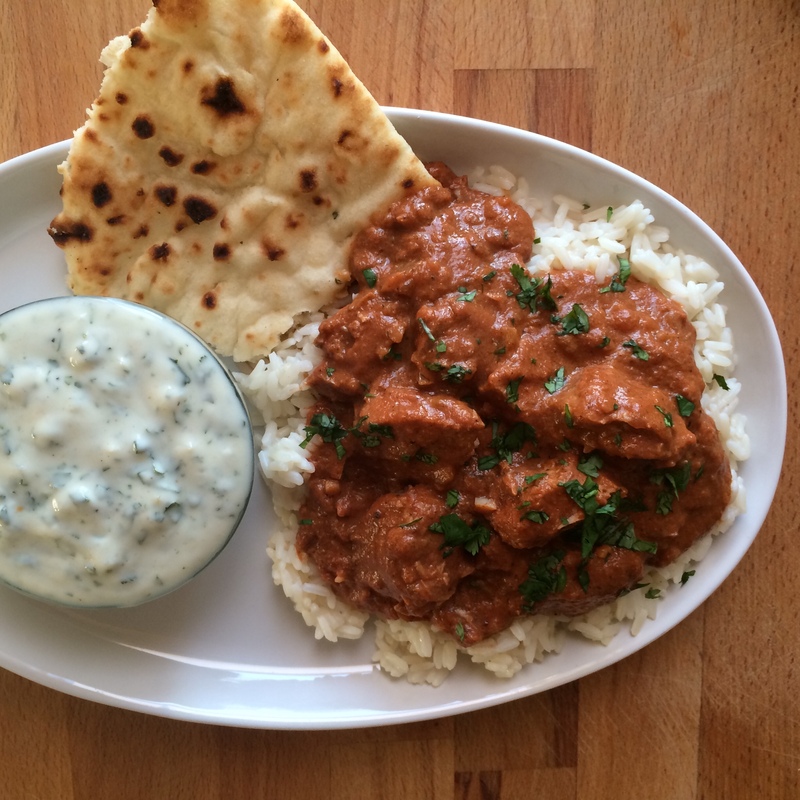 Serve chicken with freshly chopped cilantro, white rice, naan, and cilantro yogurt sauce. Note: You could easily make this dish on the stove-top. Follow the directions as is, and cook on the stove-top for 2 hours over medium-low heat. If the mixture starts to boil vigorously, reduce the heat to low and simmer for the remainder of time. After 2 hours, add the cornstarch mix, and continue the recipe as noted. Admit it. Unless it’s fried, chicken is pretty boring. Or as I like to say, BOOORING. I can’t help myself from going off on a little Emily side tangent here: Using the proper pronunciation of the word ‘BOOORING’ is always key. Make sure your voice is low, and then say those two words. BOW, (with an up voice inflection) then RING (with a downward voice inflection). Got it? Good. Now that I’ve taught you the properly cool way of saying BORING, know that this chicken dish will never be described as such. It’s far too exciting, interesting, and tasty. 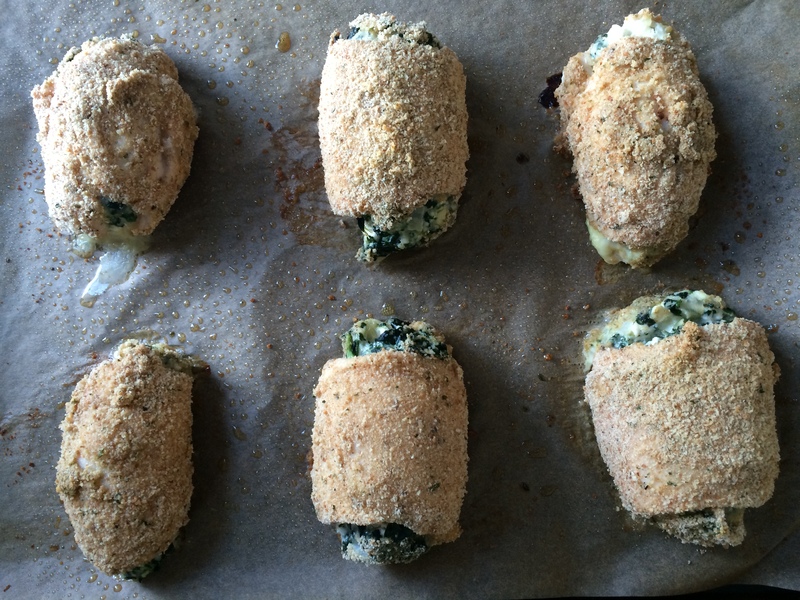 Chicken cutlets stuffed with a combination of spinach, feta, ricotta, parmesan, herbs, onion and garlic, then breaded and baked until golden brown. Wonderful for a Tuesday night, or for a dinner party. Serve along side a large salad or on a bed of couscous. Chicken is one of my standby ingredients. This is a great way to utilize a standby in a creative (did I mention healthy?) way. 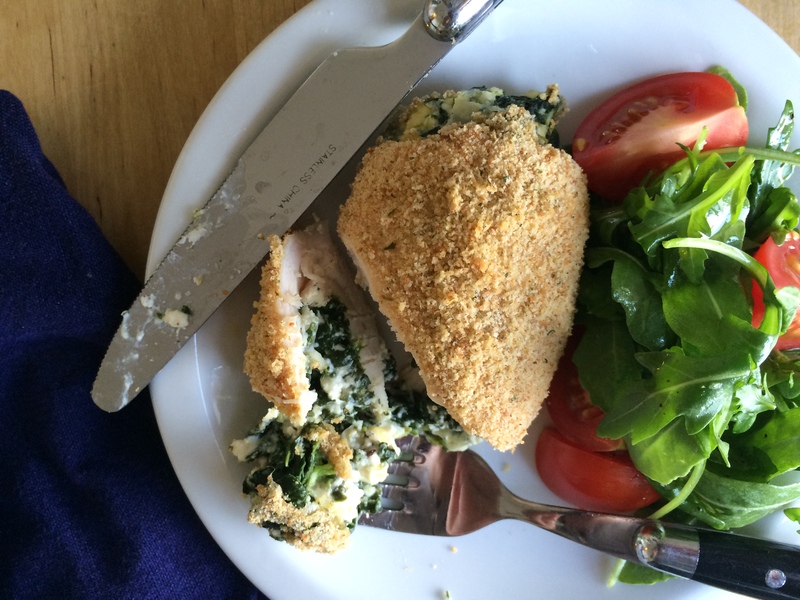 Forget the old baked, BOOORING chicken breasts (you better have said it properly there). Give these FUN roll-ups a try! Preheat oven to 350 degrees F. Line a large baking sheet with parchment paper and spray with cooking spray. Heat the olive oil in a saute pan over medium heat. Add onions and garlic and cook about 3 minute until onions become translucent. Add spinach, parsley, dill, 1/4 tsp kosher salt, freshly cracked black pepper, and cook until heated through. Remove from heat and allow to cool. 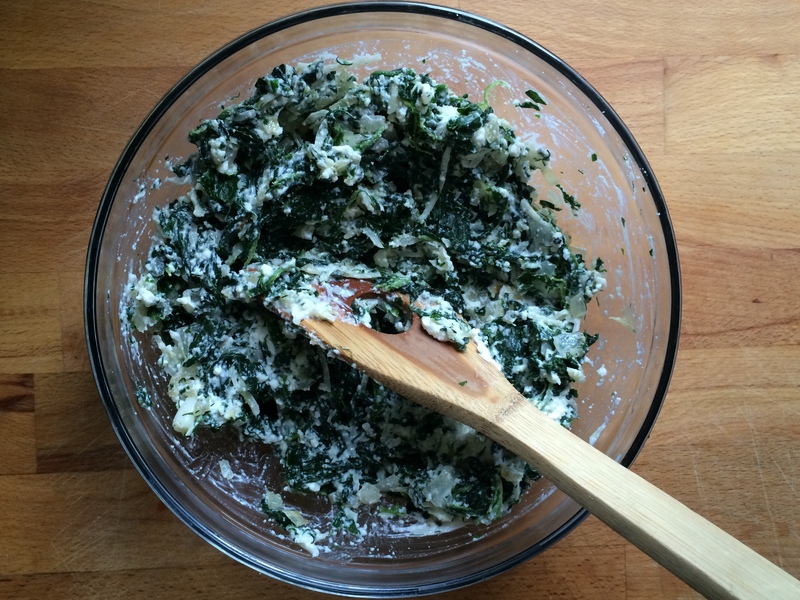 Once cooled, mix in the feta, ricotta and parmesan cheese. Season chicken cutlets lightly with salt and freshly cracked black pepper to taste. 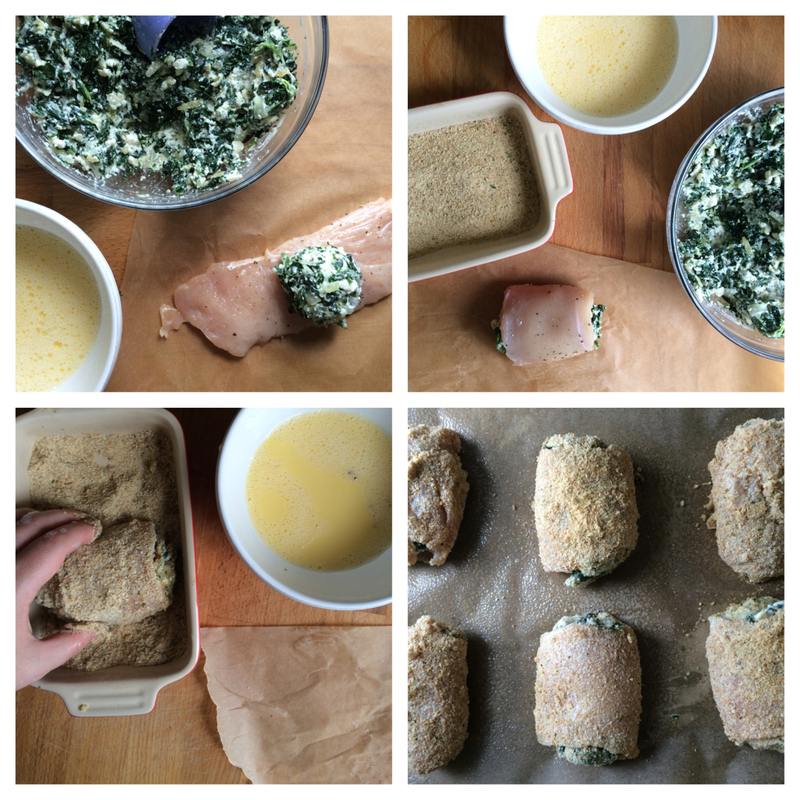 Place about 1/3 cup of spinach mixture in the center of the chicken and roll tightly. Lay the chicken seam side down on a piece of parchment paper. Repeat with the remaining chicken. Whisk the eggs and water together in a small bowl with a pinch of salt. Place the breadcrumbs in another bowl. Dip the chicken rolls into the egg wash, then into the breadcrumbs and place seam side down on the prepared baking sheet. Lightly spray the top of the chicken with cooking spray. Bake 25-28 minutes or until cooked through. Note: 1 chicken roll-up satisfies me, but my guys eat 2.